Fully caffeinated and ready to roll. Another three massage day. Life is good. 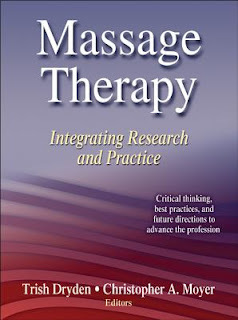 Reading Trish Dryden and Christopher Moyer's Massage Therapy: Integrating Research and Practice. I'll come up with a formal review at some point, but to cut to the chase, I can't imagine any massage therapist who reads at all wanting to pass this up. 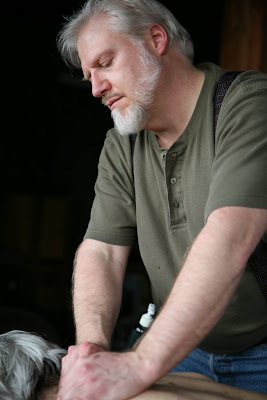 The four chapters on special populations (pediatrics, pregnancy & labor, athletes, elderly) and the nine chapters on particular conditions (headache, neck pain, low back pain, anxiety & depression, sexual trauma, scar tissue, fibromyalgia, cancer) should interest anybody who ever lays hands on a body. I've made no secret of being dubious about whether viewing massage as medical treatment is very useful. But I'm a huge fan of medical research on massage. We need to know what can reliably be said about how touch affects people, so that we don't spread misinformation, or adopt wrong-headed or even dangerous methods of bodywork. I view research information as largely negative: it tells us what not to do, how not to screw up. But that's important, no matter what it is you think you are doing.